Today me, Htawara and Flora went to Mrs Slade Literacy group. 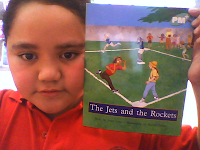 We learnt about athletics and we did a worksheet. The worksheet was a word find after the work find we went to go on studyladder. On studyladder I got a bronze and I decorated my bedroom. After studyladder I did reading the book was about The Jets and the Rockets.